Easily recognizable from the outside. Friendly staff with good english skills who are willing to solve almost any problem. 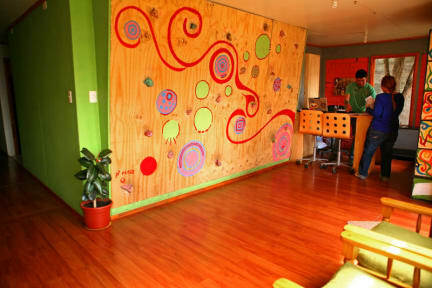 The hostel pretty much has all possible room variations from shared rooms to doubles with private bathroom. Plenty of good places to relax around hostel. Slack line out front. Our room door lock got jammed, but felt comfortable to ask for help, and problem was fixed within 10 min. Only downside is you can hear through creaky house when people move around, bring ear plugs. We absolutely loved staying here. 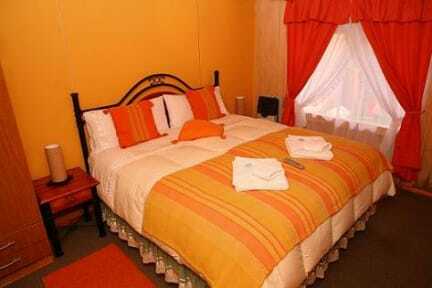 The bedrooms are clean with nice blankets and pillows and heaters in each room. There is a great common space to hangout and research for future plans. And the breakfast was TO DIE FOR (homemade bread, jams, eggs, cookies, yogurt, juice, fruit, cereal and milk). The price was a tad high, but with the hostel conditions and kitchen I’d say it’s very worth it. Would return again in a heartbeat. Amazing breakfast - including home made bread! This hostel is pretty good. The beds in the dorms aren’t bunk beds. WiFi is strong. Store your luggage. The staff is nice but they can be spacey and disorganized. I asked to book a kayak trip. The woman at the desk said yes and said she just needed to call the company. She never followed up & didn’t book. I asked to buy a ticket to TdP for two days later. They told me to wait until the day before which then sold out. No one woke up to put out bfast the day of trek. Great hostel, good kitchen and breakfast. Vibe was a bit quiet probably due to time of year. Helpful with trekking routes and planning and decent location. Good communal space and decent beds! They’d double booked us for our 2 nights before the W trek but arranged for us to stay somewhere else, unfortunately this was a B&B not a hostel but Lili’s let us use he kitchen. We stayed at Lili’s after the trek and it was very good, single non-bunk beds, good showers, and nice breakfast. Staff are rather disorganized. We booked a horse riding trip, but were never picked up. When we re-booked for next day we suddenly had to pay more because they didn’t tell us that the price doesn’t include the transport. They would have lost 2 of my socks in the laundry if I hadn’t gone back and asked for them. I also got one of my tshirts back with weird black stains all over. All I got was the comment that I can’t proof that it wasn’t like this before. Not really a way to treat your clients! Very very noisy unfortunately !